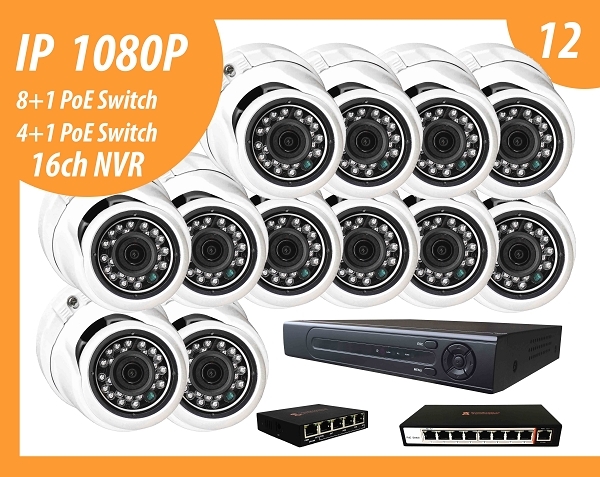 Surveillance package SA-IP12P, included HVR(Hybrid Video Recorder), which is support by multi-mode up to 16 IP 1080P cameras, Recording in 1080P quality from all 16 cameras and have option Digital zooming. With our HVR you have opportunity connect to the device Local, by Cloud, Mobile App, Internet Explorer and Client Management System, which is included on the CD to this HVR. HVR have opportunity, in Mode up to 16 1080P IP cameras, playback 2 cameras at the same time in in high 1080P resolution, you also can choose Mode up to 9 IP cameras with playback up to 4 ch at the same time. Professional Mobile App support, survey all your 16 IP cameras in real time, it also has possibility turn on HD quality mode of the camera to observe in best quality your property by Mobile phone. Application at the same time support playback by Mobile phone and all of this without commercial. Our 1080P IP cameras, which is built in PoE and working with our HVR in Plug and Play. 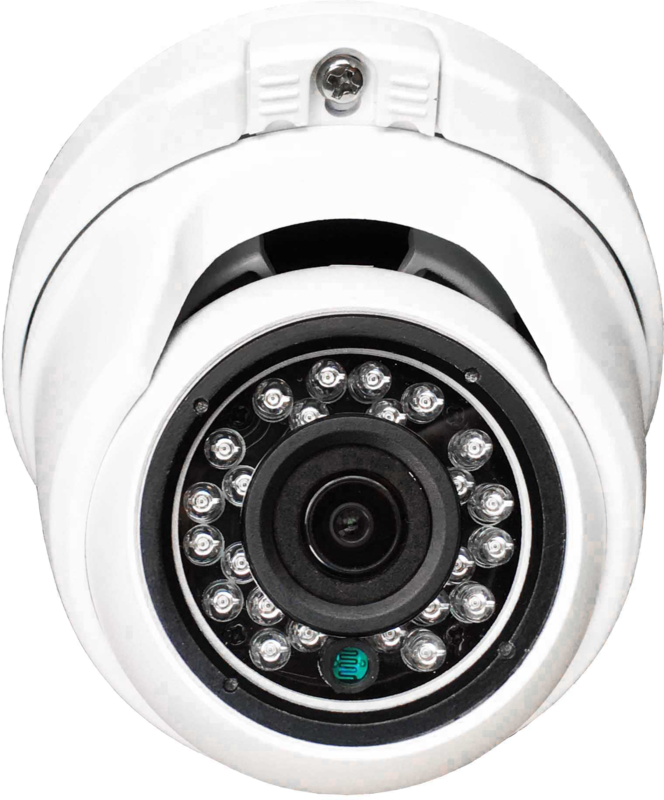 It will make your installation and programming much easier than regular IP and Analog cameras. HDD selling separate, please choose with your order one of our HDDs and we will help you to build it in your HVR. How to quick programming our DVR? 1. How to open Guide to start quick programming your HVR? For this you will help Guide. It aftomaticaly comes on monitor when you turning it ON or restarting it, you also can open it manual, open short menu by click right button of your mouse on the main sceen(screen, where you can watch in life all your cameras), there is second item, it is button to open Guide. To start programming it press NEXT to open second page. 2. Second page - Time and Language Confiquarion. First, please choose Time Zone, for Canada and US: UTC-05:00, next you will need set-up time, to all your cameras and HVR follow time for PlayBack if you will decide take a look recorded files from your cameras. Other items on this page complitely up to you. 3. Third page - Network Test. Here you can configurate and test your Network settings, to have posibility use mobile app on your phone to servay your cameras and have opertunity connect to your HVR by Internet Explorer or CMS(Client Management System), which you also can find at the each CD disk with your cameras and HVR. First you please check if you connect network cable to your HVR, then press Network, it will show you all network settings to connect it to Internet, If you will use just Mobile App and HVR to servey your cameras, please tick - DHCP Enable and press OK( HVR automatically choose any free IP address in your network and will follow your Router to connect automaticaly to Internet.. If you want use CMS and/or Internet browser also you should setup network settings manual by fill IP any free IP in your network and give to it Gateway and DNS server of your Router, for this please follow edditional instruction. There you will need scan QR code and download mobile app from App Store(Iphone) or if you using Android phone from Google Play. If you dont know how to use scan code(QR) please find this mobile app on your phone's Store: XMEye. Then, when you download and install App on your phone you can go to the NEXT step on your HVR. First find downloded mobile App in your phone and open it, find link "Register or login Problems" please press it. there you can register your account in cloud to have opertunity connect to your HVR by same acount from diffrent phones. At the next menu choose "Register", then fill your true email address (becouse the app will ask you the code, which it will send on your e-mail box) and press next. Please go to your e-mail box and find there the letter, It can be on the "Spam", copy code and fill it to the form of the app and press next. Fill the form and press Register. Now you registerren your login and password and you can go to the app by Login to your account. Next step, when you already inside press "+" on the right top corner of your screen, you will see menu, which you need to fill to add your HVR to mobile app. In openned menu, please give any name, which you like for your Device(HVR) for exemple "Home", after app will show you it by this name on the Device list. Second field you will need press picture of QR code, which locate at the end of the field, now you can scan code by your phone from the monitor to which was connected HVR. If you didn't change change login and pasword or your HVR, you can fill there Login: admin, without any password. now you ready to watch your cameras by mobile phone, please press OK. Restart the app, if you didn't find added HVR at the Device List. If you see next page of the Guide - Mode selection, its mean your DVR(HVR), right now working on the mode with IP cameras and if you connect to it Analog cameras(AHD, TVI, CVI, CVBS) you will need to change the Mode, but if you connect to it IP cameras please select "Quick set", which will connect your IP cameras automaticaly by one step(it will work just with our IP cameras, but sometimes it also working with different factories' IP cameras, if they follow our software). If you can't see your IP Cameras on the DVR(HVR, NVR), even when mode for IP cameras is working, check if you connect all your IP cameras to the PoE switch and switch and HVR connected to your Router. If all is good, you might use IP cameras, which DVR(NVR,HVR) can't find automatically, dont worry, we can set it up it manual. Now, we need to find, which IP cameras you connect to it, it might working by ONVIF protocol and we should put that cameras at the same network, where is your DVR(NVR, HVR), for this you will need help specialist and we will help you even if you didn't buy our cameras =), please contact as. Can't see analog(AHD, TVI, CVI, CVBS) cameras on the HVR. Before change the mode for analog cameras, be sure you connect all cameras to the HVR and it powering too. Then go on the main screen of your HVR(Desktop), Press right button of your mouse, at the opened menu, choose first one - "Main Menu", then you will see there categories, you willl need to choose "System", find there "Digital' and open it, after this press on the icon - "Channel Type". It will open new window, where you can choose type of the modes, which going to work with your analog cameras, it is going to be category "Local", tick the right mode should be first one 4 ch 1080P(analog), then press OK, HVR will ask you restart it, do it, if it won't ask you, you might didn't choose other mode and you will need to go there back and choose it again. When you will restart HVR all should work automatically. Can't see IP cameras on the DVR(XVR,NVR). Before change the mode for IP cameras, be sure you connect all IP cameras to the HVR by PoE switch which is networking it and powering by single ethernet cable. Then go on the main screen of your HVR(Desktop), Press right button of your mouse, at the opened menu, choose first one - "Main Menu", then you will see there categories, you willl need to choose "System", find there "Digital' and open it, after this press on the icon - "Channel Type". It will open new window, where you can choose type of the modes, which going to work with your IP cameras, it is going to be category "IP", tick the right mode 9 IP 1080P or 16 IP 1080P, if you connect to it cameras with higher resolution, choose other modes, if you have 4 MP, ith will be work with mode 5MP. Then when you tick right Mode, please press OK, HVR will ask you restart it, do it, if it won't ask youmight didn't choose other mode and you will need to go there back and choose it again. When you will restart HVR all should work automatically. If you will have any problem to connect or programming our HVR, please contact us, we will be happy to help you. THANK YOU FOR CHOOSING OUR EQUIPMENT! Got this package few weeks ago, all working good! Respect to manager of Smart Access, really nice and positive guy, had a chance see him in person.